This abstract has been submitted to the upcoming NACE International CORROSION/14 Research in Progress Session on Passivity and Localized Corrosion. Coauthors: Mauricio Rincón-Ortiz (first author), Mariano Kappes, Martín A. Rodríguez, Ricardo Carranza, and Raúl Rebak. In the offshore oil and gas industry, materials selection philosophies are traditionally based on the International Standard Organization (ISO) 21457 or de NORSOK M-001 specifications. According to these standards, materials are arbitrarily defined as seawater resistant if the pitting resistance equivalent (PREN), PREN = wt.%Cr + 3.3 wt.%Mo + 16 wt.%N, of the alloy is above 40. Alloys with a lower PREN cannot be used without cathodic protection subsea, limiting the spectrum of candidate alloys significantly. Additionally, this definition of seawater resistance seems over-conservative and contradicts a large body of research on localized corrosion of corrosion resistant alloys (CRAs) with intermediate PREN values. In this work, the localized corrosion resistance of martensitic, ferritic, austenitic, super-austenitic, duplex, lean duplex, and super-duplex stainless steels, as well as several nickel alloys has been investigated. The alloys selected covered a PREN range from 13 to above 65. Cyclic potentiodynamic polarization (CPP) tests were conducted in 3.5% NaCl at pH 8.0 at room temperature in accord with the ASTM International G61 specification. The correlation between pitting, transpassivity, and repassivation potentials (Ep, Etrans, and Erp, respectively) was investigated. Results showed that while a linear dependence between Ep (or Etrans) and PREN was found, Erp had no clear correlation with PREN. 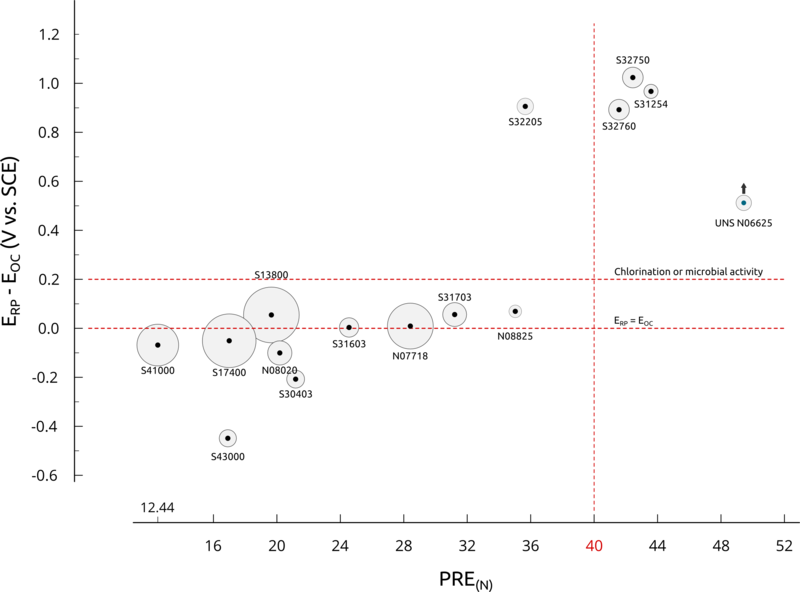 These results suggested that the alloy's localized corrosion resistance cannot be accurately described in terms of PREN alone. The use of a critical potential, e.g. Erp, and the steady state open-circuit potential, as measured in NaCl-containing electrolytes and in seawater with or without chlorination, is explored as both an alternative materials selection criteria and a quality assurance procedure that could be incorporated in future revisions of ISO 21457 and NORSOK M-001 standards. Figure 1 is still a work in progress but summarizes some of the main findings to date. I will explain the implications of these results on a later post. Figure 1. (ERP - EOC) vs. PREN. The size of the circle is proportional to the yield strength (YS) of the alloy.